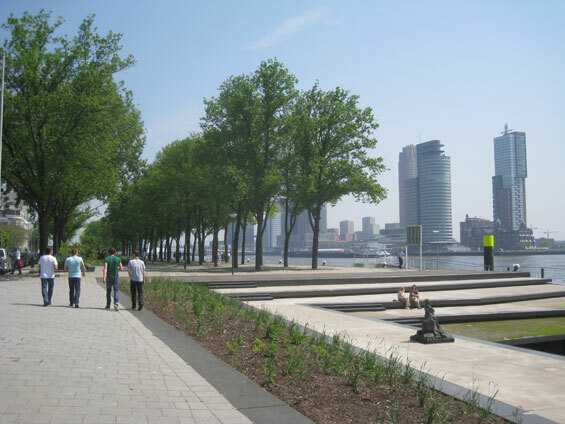 The vision for the city of Rotterdam is that it should be again the city engaging with the river Maas. The docks play an important role as a transitional area and recreational support. Recreation strengthens the relationship between city and water. In particular, the northern quays have been given a green and softer atmosphere, which reinforces the long line of the series of quays. 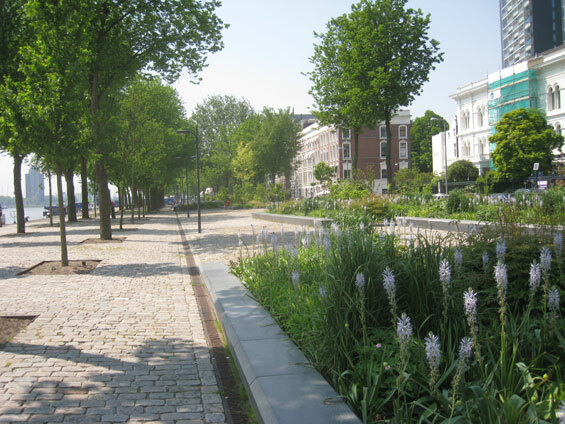 The Westerkade and Parkkade are part of the northern shore and form an almost unbroken line along the Rotterdam waterfront. 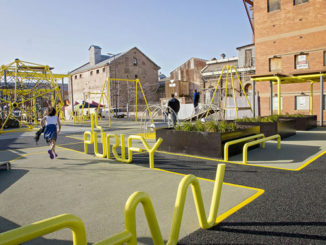 Unity in design makes both docks into a continuous whole, without diminishing the different characters and ways of use. The Parkkade still serves as a landing dock for cargo. It is one of the few places in the centre where the atmosphere as a world port of Rotterdam is still recognised. 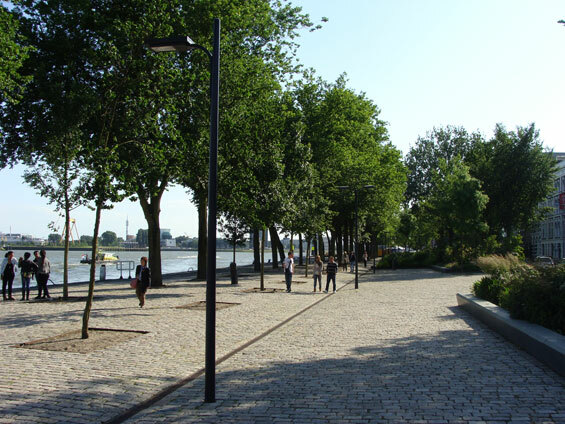 Currently, the park is still cut off from the Maas; this is where the vision indicates how the relationship with the lower quay can be strengthened. The Westerkade has become a place to stay, with an attractive programme. The idea of is based on functional flexibility. An inviting place, which provides both intimately scaled and large scale spaces and has an ability of adapting to larger and smaller events. 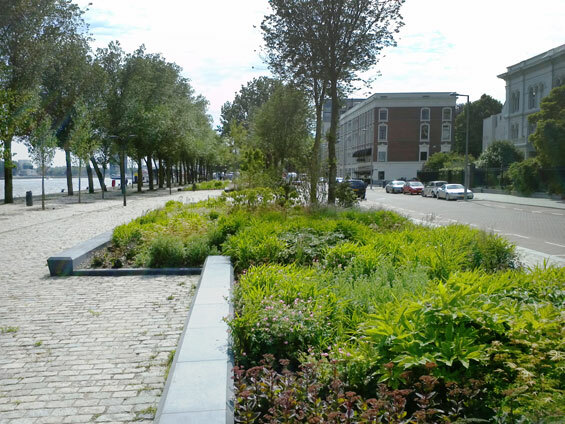 To achieve this, the quay is cleared of parking creating new opportunities for Westerkade to become an attractive place to stay and a green atmosphere. The new layout provides a basic profile with a clear beginning and ending with its own zoning. The existing trees are retained wherever possible with a comprehensive single row of trees on the side of the road. At head of the ferry terminal there is a new pavilion with a terrace overlooking the river Maas. The existing harbour for the water taxi is transformed into an attractive place along the Maas, with a wide staircase to the water and a wooden platform as a new stop for the water taxi. 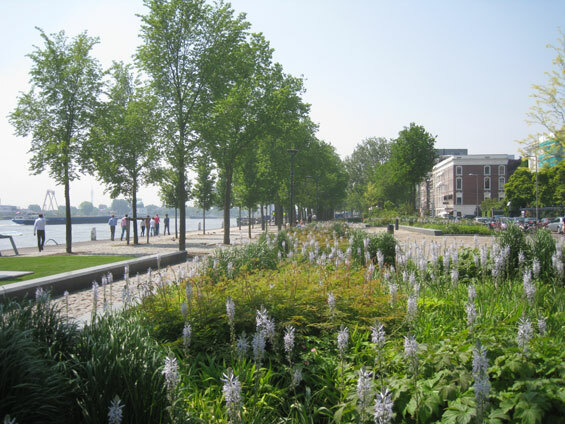 Between the edges of the docks there are a series of smaller green spaces created with beds of ornamental grasses and perennials. In these places, both public sitting areas and terraces can be found. On the quay elm trees determine the image as seen from the water and from the south of the Maas. In the existing double row of trees some trees are missing. These will be supplemented where necessary by new elms. The green image of the pontoon, not only created by trees, but also by a green ground. 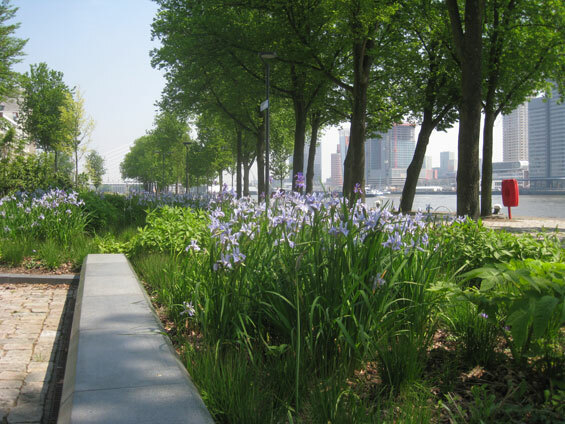 This surface consists of green grasses supplemented by perennials and bulbs. The grasses have a striking appearance and beautiful flowering spikes waving in the wind, while the perennials to provide a more varied picture throughout the seasons. 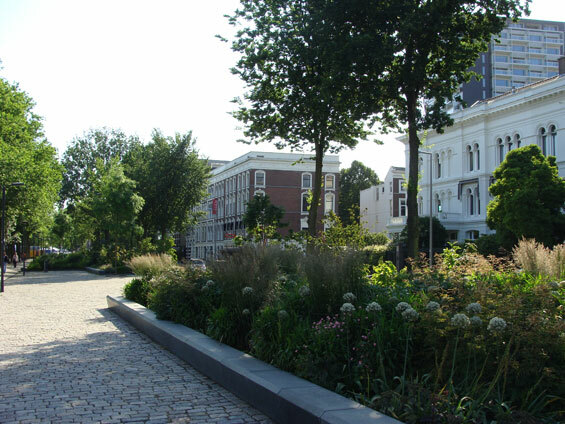 For Westerkade and Parkkade the existing natural stones have been recycled. In the concept only the walking zone along the water and the two heads are made form new material. For the rest of the pavement on the quay the existing stone is reused.